In 1977, statistician Maggie Ryan returns to her alma mater to help Charlie Fielding analyze his reading research. Charlie, professor and film buff, is studying the eye movements of skilled readers. Maggie’s work is interesting, her kids have good daycare, and her actor husband Nick O’Connor is working nearby. But the happy summer plan is disrupted when Charlie’s popular colleague and rival, Tal Chandler, is found shot near campus. When a turf war between town homicide detectives and image-conscious campus police hinders the investigation, Maggie and Nick team up with Tal’s grieving widow to get some questions answered. I enjoyed this mystery in an academic setting. Maggie is a tenacious investigator in solving the mystery. I liked how she peeled away layers to get to the core of the reason for the murder. There were so many suspects I didn't know who to concentrate on. And then the twist at the end was a surprise. Carlson's writing style is different and it took me a while to get into the flow of the words. While the novel takes place on an east coast university, I almost felt like I was reading a British mystery. I recommend this novel to readers who enjoy a methodical investigation into a murder by an amateur. You'll also learn a little about how academic research centered on reading might take place. You can read my review of the previous novel in this series, Murder in the Dog Days, here. Statistician Maggie Ryan, actor Nick O’Connor, and their two small children are looking forward to a relaxing summer away from New York City. Maggie’s working at her alma mater as consultant to reading expert Professor Charlie Fielding, and Nick has a gig at a summer theatre nearby. But then the body of Charlie’s retired predecessor, Professor Tal Chandler, is found near campus. It seems to be suicide–– but the gun was in left-handed Tal’s right hand. With help from Tal’s grieving widow, Professor Anne Chandler, Maggie and Nick find that friendly, nosy Tal had uncovered some dark secrets about his university coworkers––secrets that could lead to murder. Sunlight sifted through the trees. The creek giggled below. A little child galloped down the path, paused to pick up a pebble from the mud, ran back to her smiling mother. They moved on past, until their happy chatter merged into the rustling of the leaves. A sweet day for a murder. To get to Plato’s for Tal’s celebration, they had to cross the gorge. Maggie unhesitatingly chose the right path from among the several that meandered down into the wooded ravine. “I see you still know your way around,” Charlie observed. “Yeah, it comes back. It was only seven years ago that I left. Which way do you prefer here?” Maggie paused at a fork in the trail, where one path led to a green-painted metal pedestrian bridge, and another wound lower and under the bridge along the edge of the little creek that had patiently carved out this gorge. “Aren’t those big city parks dangerous?” He had to stretch to keep up with her athletic strides. “In Prospect Park he’d probably be a bird-watcher,” Maggie said lightly, and turned back up the path toward College Avenue and Plato’s. 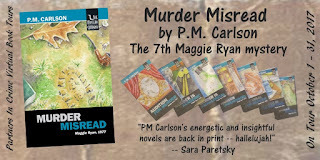 Excerpt from Murder Misread by P.M. Carlson. Copyright © 2017 by P.M. Carlson. Reproduced with permission from P.M. Carlson. All rights reserved. writing was more fun. She has published twelve mystery novels and over a dozen short stories. Her novels have been nominated for an Edgar Award, a Macavity Award, and twice for Anthony Awards. Two short stories were finalists for Agatha Awards. She edited the Mystery Writers Annual for Mystery Writers of America for several years, and served as president of Sisters in Crime. Catch Up With Our Author On: Website, Goodreads, Smashwords, & Twitter! I received a complimentary digital copy of this book through Partners in Crime Virtual Book Tours. My comments are an independent and honest review. The rest of the copy in this post was provided by Partners in Crime Virtual Book Tours.